This page from Darwin’s First Notebook on Transmutation of Species contains what I believe to be the most important scribble ever written in the history of science. No doubt, scribbles exist elsewhere which also capture historic moments in scientific progress. I suspect they can be found in the drafts for Isaac Newton’s 1687 “Principia” announcing the the discovery of his universal law of gravitation or in the manuscript of Einstein’s 1905 "On the Electrodynamics of Moving Bodies" in which he reveals to the world his grasp of mass-energy equivalence or in Rosalind Franklin’s lab notebooks from the early 1950s and the very first realization of the helical structure of the DNA molecule. 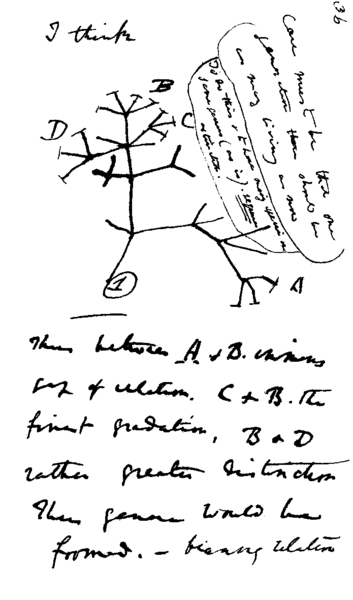 But I dare say that none of these is both as profound and as accessible as Darwin’s 1837 sketch. In it, the great naturalist divines the origins of the biological world we see today as the vivid branching of a tree of life. Hidden in the subtext, if scribbles are allowed to have subtexts, is the answer to the question of human origins, as well. 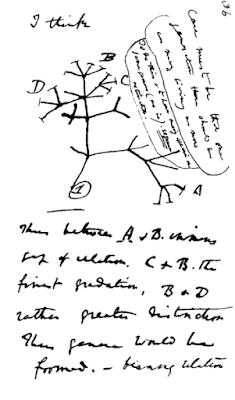 There is some poignancy with which I recall Darwin’s scribble today, the 208th anniversary of his birth in 1809. Having had a hand in the initial organization of the March for Science in Atlanta, a counterpart to the national march scheduled in Washington, DC for April 22, it was with some interest that I watched the national mission statement and a local variation unfold. It was no mean feat to bring so many committed and engaged people together, along with their differing scientific and political agendas, to decide on a public statement intended to communicate what the march was about. Personally, and as the executive director of the Atlanta Science Tavern, I support the results of their effort; I learned long ago, and was painfully reminded in the course of our most recent national election, that holding out for perfection when it comes to selecting platforms or candidates is a prescription for disaster. Nonetheless, I am saddened by the fact that the national mission statement, in the interest of maximizing buy-in from those not-yet persuaded of the importance of evidence-based policy making, has been drained of all specificity. There is no overt mention, for example, of climate change or vaccination in it. But what troubles me the most is that reference to Darwin’s great contribution has also been omitted. It’s as though Darwin’s conception of the process of evolution through natural selection has become a theory that, at least in some quarters, dare not speak its name. And the reason I find this so troubling is that the fight to teach evolution in public schools here, going on now for over one hundred years, is the prototypical battle pitting scientists and the best possible, indeed irrefutable, scientific evidence against elected officials whose political opposition stems from uninformed, indeed willfully ignorant, parochial opinion.